Quick drop-off mission. Pulled in a little before 7 pm with Dad’s aluminum trailer behind me. I made quite the circuit today. Left Oshkosh for Farmer Joe’s where I dropped off the trailer, continued on to Milwaukee for my annual ticker check up, then stopped back by Farmer Joe to load up some goodies. The previous owner of his farm had left a lot of things behind in the shed and Joe was getting sick of it all taking up space. He’s been living there a year and gave the guy one more week to clear out. He came by and cherry picked a few things but left some interesting stuff behind. 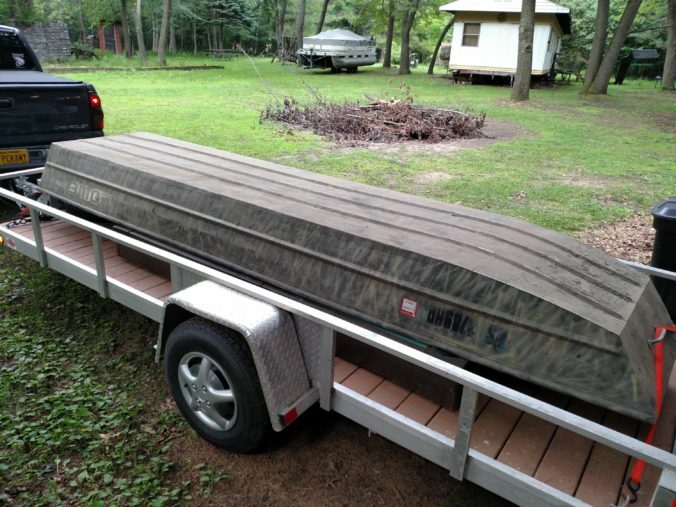 I picked up a pool table and a 14′ duck boat. Figured both might be fun additions to Puckaway if they’re in decent shape and easy enough to dispose of if they aren’t. I set the pool table top on end in the pole barn, laid the duck boat upside down over Defiant, checked on things in the keep, and headed out around 7:30. Hoping to get home in time to watch the EAA night air show with my boys.